There is extreme. Then there’s Charlie Engle – a man who has run across deserts, summited ice-covered volcanoes, swam with crocodiles, overcome crack addiction and survived a stint in federal prison. The story goes like this: after a hair-curling, decade-long love affair with booze and crack cocaine that culminated in a near-fatal six-day binge and a hail of bullets, Charlie finally gets sober. For solace, he turns to running, which becomes his lifeline, his pastime, and his salvation. He begins with marathons, but it wasn’t enough. Ultramarathons soon became the focus of his affection, a new love affair that takes him to stunning heights and accolades. 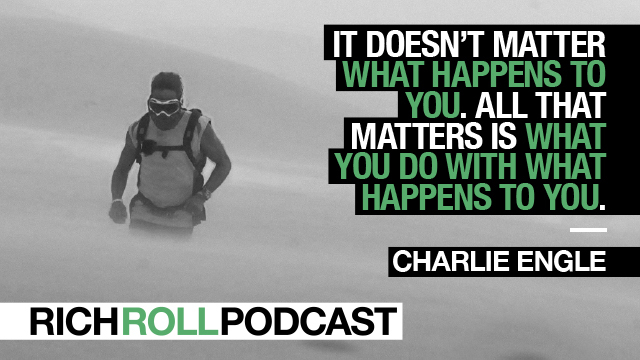 During this second act, Charlie would clock a handful of impressive top-10 finishes at prestigious races like Badwater, a 135-mile jaunt across Death Valley widely considered to be the toughest footrace on Earth. But his athletic zenith is an unprecedented, absolutely astonishing 111-day, 4,500-mile run across the Sahara Desert — a feat chronicled in the Matt Damon narrated documentary entitled Running the Sahara. Then came quite possibly the most bizarre and improbable challenge Charlie could ever imagine facing. A bad B-movie narrative that involved an obsessed IRS agent with an axe to grind. Wire taps and garbage probes. Even the requisite wily enchantress dispatched to entrap. A saga that culminates in an unjust conviction for mortgage fraud. A poster child for everything awry with the mortgage-backed security crisis, Charlie serves 16 months in a West Virginia federal prison – what Charlie jocularly refers to as his federal holiday. He could have played the victim. Instead, he spends his days pounding the small prison track, running endlessly in circles. Soon his fellow inmates were joining him, struggling to keep their spirits up in dehumanizing circumstances. A prison hero by the time his sentence concludes, Charlie now embraces his third act as a more fully actualized version of his pre-shackled self — armed with newfound perspective and a grateful appreciation for what matters most in life. Charlie is one-of-a-kind. A world class talker and master storyteller, I knew Charlie’s new memoir would be a page-turner. But I didn’t expect the book to be so well written. Running Man: A Memoir is every bit the gripping, raw, honest, funny, emotional, at times cringe-inducing, but ultimately inspiring story I hoped it would be – and then some. I’m thrilled to bring you my second conversation with Charlie. Picking up where episode 67 leaves off, (a must listen if you’re new to the show), this is an intimate discourse about high highs and low lows. It’s about addiction, sobriety, service and spirit. It’s about perspective. Nine lives and third acts. What it means to touch the threshold of human endurance. Lyft is your friend with a car, whenever you need one. Download the app and get an affordable ride from a friendly driver within minutes. Right now, Lyft is offering my listeners a special deal. First time riders get three FREE rides, up to $10/EA when you enter promo code “RICHROLL”.